Lauren Wirdzec starts strong with a swift dive into the first event. Photo by Joelle Bassett. 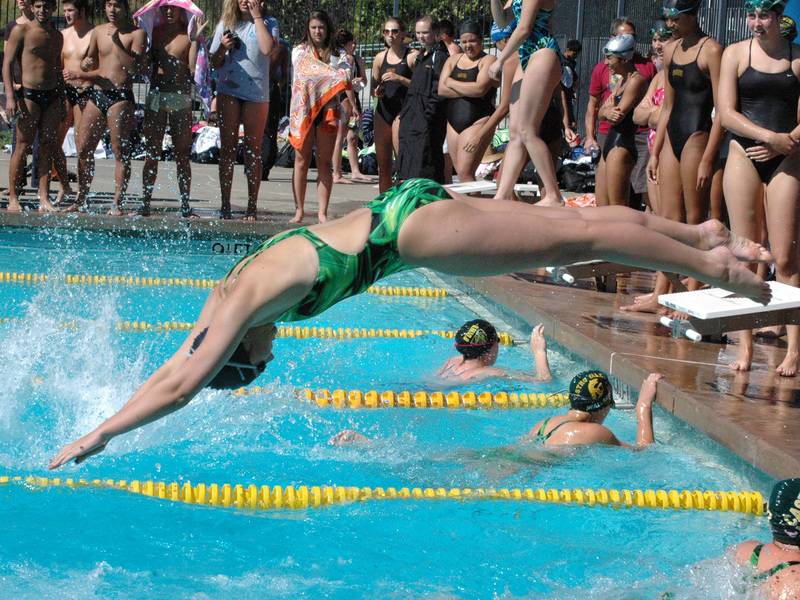 The Trojan swim teams had a tremendous victory as the boys and girls squads swam their way to the top on April 17. CVHS competed against two other schools, Encinal and our biggest rival, Bishop O’Dowd. Our overall swim team consists of more than 75 enthusiastic swimmers who have more energy than any of the other swim teams. The first of the competitions was the medley relay, followed by the 200-yard freestyle. After all the events, both the junior varsity and varsity girls and boys smoked their competition, ending with victories of 20 to 100 points ahead of the other schools. Overall, the JV girls beat O’Dowd 135 to 35 and the JV boys won by 135 to 31. 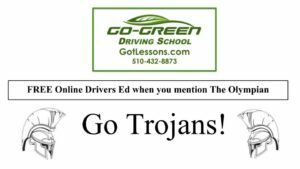 The varsity teams also left O’Dowd behind, with the girls scoring 105.5 points to O’Dowd’s 84.5 points, and the varsity boys came away with a lead of 116 to 54. Lauren Wirdzek and Kate Miller placed with the highest scores for the varsity girls, while Miles Teague and Victor Deng placed high for varsity boys. The swim teams were ecstatic about their notorious win and have high hopes for the rest of their season. “When we found out we won we were really excited!” said Wirdzek. At the rate in which the team is going, the swim teams feel optimistic about their goals and the rest of their season.